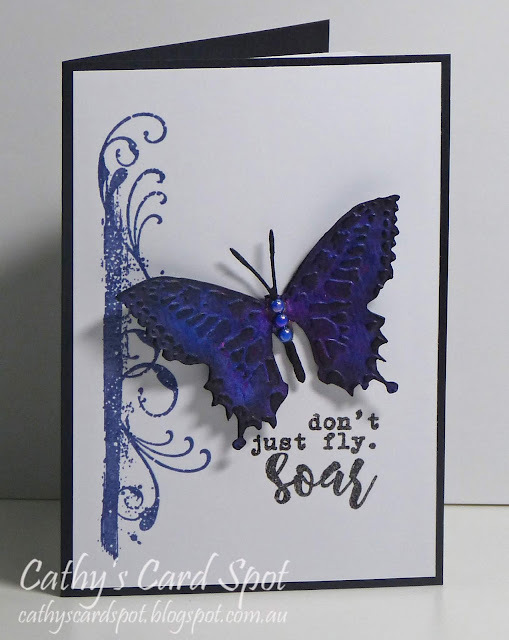 Cathy's Card Spot: Bits Box Butterfly! Hi everyone, the theme at Less is More is to use something from your leftover bits stash! I had this butterfly diecut from a play with dylusions sprays a couple of years ago! I embossed it with the matching folder, brushed the peaks and edges with some black ink, added some bling and it was finished. The scroll is stamped with versafine imperial purple ink and clear embossed, and the sentiment stamped in versafine black and clear embossed too. It says don't just fly. Soar. (Hubby had trouble reading it). I'm also linking up to the butterflies challenge at Double D Challenges, where they have this gorgeous mood board for inspiration. I was taken with the lower left one! 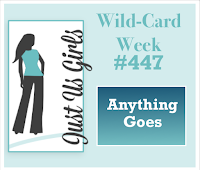 At Just Us Girls the theme is anything goes. 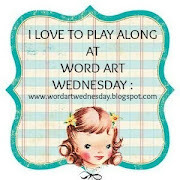 At Simon Says Stamp Wednesday it's also anything goes. as long as you use a sentiment or bible verse. Sizzix butterfly duo die and embossing folder; antenae from a Memory Box butterfly die; Dylusions inks, probably fuschia, grape and midnight as these are the only purples and blues I have! black soot distress ink; Katzelkraft flourish border stamp; Stamplorations Noteworthy 2 setiment; versafine inks, clear ep. GORGEOUS! Love that butterfly Cathy and your design showcases it beautifully! 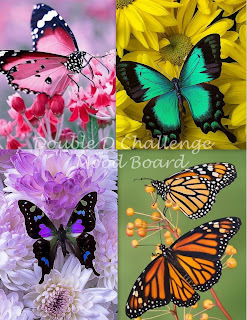 Thanks so much for joining in the fun at our Double D ‘Butterflies’ challenge! Good Luck and we hope you’ll come back often. A perfect card composition. Both beautiful deep colors and shapes used made me fall in love with this card, Kathy! Beautiful and simple. It's a real stand out in the link up at Double D and I'm so glad you shared it with us! Very elegant and absolutely gorgeous! Truly an inspirational card. Thanks so much for joining the Double "D" Challenge Challenge. Oh my goodness, this is CAS perfection! I really love the depth of color you used and the placement of everything is so well crafted! BRAVO! So happy you could join the ATG challenge this week at JUGS!!! Hope you come back often! LOVE that bfly! Turned out awesome - Thanks for joining in at JUGS. What a fabulous find in your bits box Cathy and I'm delighted you were able to use it for our challenge at Less is More. Love the minimal colour combo and elegant detail to your card. 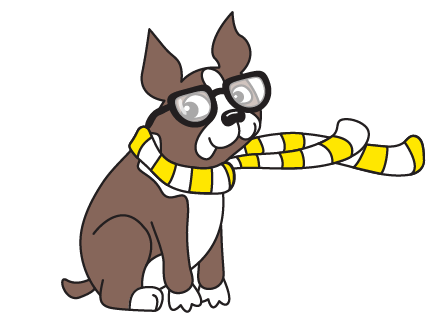 Thanks for playing along with us. Very beautiful Cathy, I really like how you have used the border stamp. Very eye-catching butterfly! It’s more than a bits in your box, it’s a treasure! Love the fabulous CAS design of your card. Thanks so much for sharing and for playing along at Less is More. Gorgeous, the depth of the blue on your butterfly is stunning. Love that butterfly and the flourish down the side. Better get Hubby to go to Specsavers. Easy for me to read as I have a few stamps like that lol.